The tragedy is the tenth self immolation in one month since a "social protester" set himself alight. A woman aged about 70 set herself on fire in her home Wednesday and is in moderate to serious condition in Beilinson Hospital with third degree burns. The woman, a resident of Rosh Ha'Ayin in central Israel, may have taken the desperate step because of tensions with her husband and daughter. Niv Granot of the Ichud Hatzala emergency service told reporters: "When we arrived at her apartment, we found the elderly woman still conscious with bad burns after she set herself on fire with the aid of alcohol. 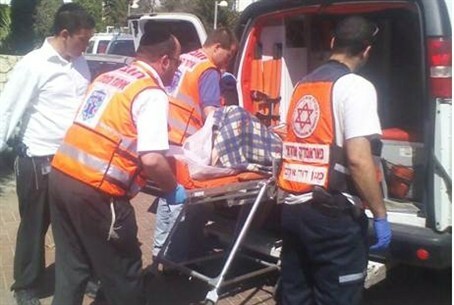 Along with several other Ichud Hatzala paramedics from Elad, Rosh Ha'Ayin and the environs, I gave her initial medical care and she was evacuated to receive treatment in the hospital." This is the tenth case of self-immolation in Israel since Moshe Silman, who participated in the "social protest" demonstrations in Tel Aviv, set himself on fire and eventually died. That case received intense media attention, with some commentators lionizing Silman as a symbol of the struggle against Binyamin Netanyahu. Other writers warned that turning Silman into a hero would only encourage other desperate people to take similar steps. A source in Ichud Hatzala noted that self-immolation does not necessarily result in death, but causes extreme pain.